Pouch Making Machine For Three Side Seal Bag / Stand-Up Pouch / Zipper Pouch Video(FTSC-V) - HCI Converting Equipment Co., Ltd. 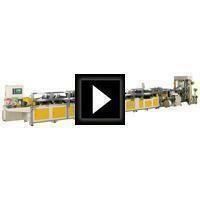 Suitable for sealable co-extrusion films, multi-layer films such as laminates of Polyester,BOPP and CPP... The FTSC-V Pouch Making Machine is ideal for the production of 3-side sealing bag, stand-up pouch, bottom gusseted stand-up pouch, zipper pouch, combined stand-up/zipper pouch.